Let There Be Light: A Festival of Lights in West Adams Avenues. WAHA's 22nd Annual Holiday Historic Homes Tour and Progressive Dinner. WAHA will celebrate the warm glow of the season with A Festival of Lights in West Adams Avenues, at the 22nd Annual Holiday Historic Homes Tour and Progressive Dinner, on Saturday, December 6, and Sunday, December 7. We'll make merry amid bright lights and bedecked homes, toasting the season with champagne and an enticing holiday feast. WAHA's traditional holiday tour features a sumptuous progressive dinner, with each course served in one of the featured properties. This year we are "shining a light" on the world's cuisines, and will feature an internationally-inspired holiday menu. We've also scheduled a Sunday afternoon walking tour, without the food. AT THIS CEMETERY, THE FAMOUS COME TO 'LIFE.' A silent screen leading man of 'Northwoods' dramas, a Medal of Honor recipient of the Spanish-American War, a pioneer 19th century photographer, a founder of the University of Southern California, and the Queen of the Fiesta de Los Angeles - All Come to 'Life' at the 18th Annual 'Living History Tour' at Angelus Rosedale Cemetery. WAHA invites you to meet Mary Ross Smith, author of the memoir Soul Survivor, at an author's reception/talk and book signing event at 2280 West 21st Street (Western Heights). WAHA's Annual Historic Preservation Meeting: "Landmarks Won and Landmarks Lost," Saturday, May 31, 11 a.m. to 1:30 p.m. (Program at Noon). The Historic Union Square Theatre, 1122 West 24th Street. WAHA's Annual Spring 2008 Historic Homes & Architecture Tour. Properties will be open from 10 a.m. to 4 p.m. -- Last ticket sold at 2 p.m.
Click here for a printable flyer including a mail-back registration form. Or Click here to proceed to our news story. On Saturday, April 26, the Los Angeles/Santa Monica Mountains chapter of the California Native Plant Society is sponsoring a public talk on the use of native plants by the well-known garden expert Lili Singer along with a house and garden tour of the meeting house on Van Buren Place. The talk and tour are free. West Adams residents are invited to learn about the use of low-water and ecologically friendly native plants for their gardens. Reception with the Artist: Saturday, March 1 1 p.m. The 21st Annual WAHA Historic Homes Holiday Tour & Progressive Dinner. 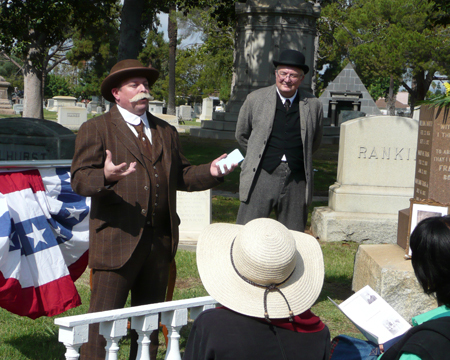 We are introducing our new Photos and Slideshows section (now on the left main menu) with a set of photos from our annual Living History Tour at the historic Angelus Rosedale Cemetery, September 29.